When my wife turned 50 recently, I offered to cook her something. This was her only request: chap chye. It turned out fabulously well. I will share with you what went into it. 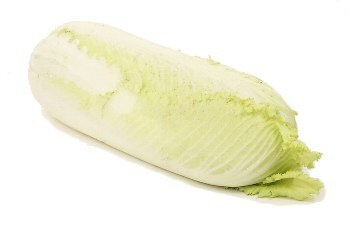 First off, the cabbage I like to use is the white long cabbage from either Malaysia or China. It is sometimes called Napa Cabbage or Wong Bok. It is very cheap here. It has thick crispy stems which can be luscious and sweet when braised. I have tried other types of more expensive cabbage variations but I still prefer this. Just remember that the leafy part will cook faster than the stem. Tthe logical thing to do is to separate these two and cook the stems first. In fact, the key to good chap chye is to braise the cabbage well. It needs to be soft enough and yet not breaking apart. For the mushrooms, the variety I like the most are Korean Shitake Mushrooms. I buy my dried shiitake mushrooms from the Yong To Fu stall (6-46,/47) at Lucky Plaza. It is thick, has a firm chewy texture and intense flavour. It is like a cross between Chinese and Japanese Shitake Mushrooms. You can sample the cooked mushrooms which they sell at the stall. During peak hours, the queue can be long. As for the sauce base, for my Mum it was always white fermented bean curd (fu yi). And I agree with her. It just go so well with the white cabbage. I know the white beancurd is meant for dipping and the red variety for cooking. While generally true, the former is simply delicious for this recipe. 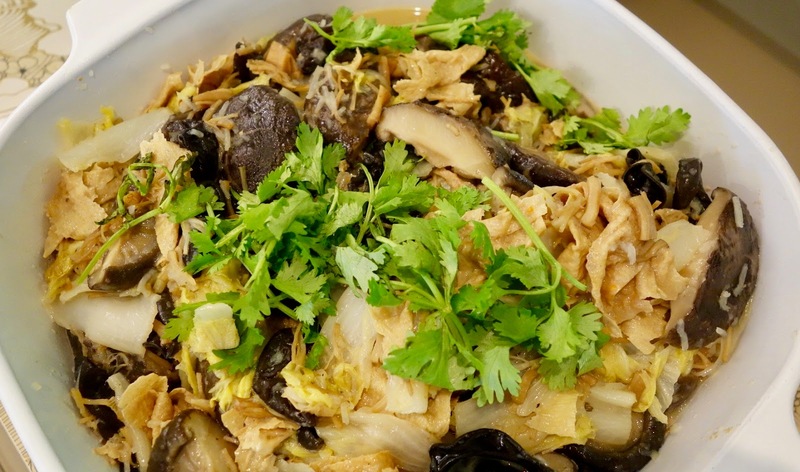 As for black fungus, the Tibet Wild Black Fungus is good. 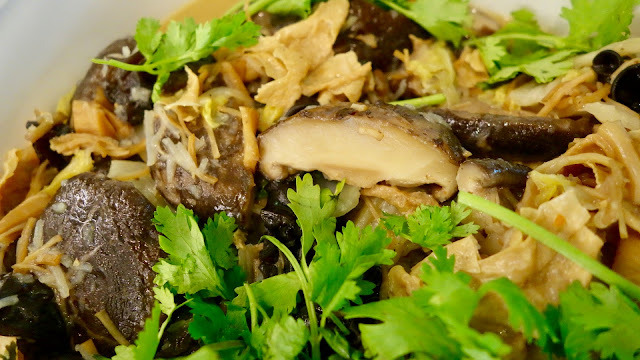 It is more expensive than the normal black fungus but it has a nice texture and there are no hard parts that needs to be trimmed and discarded. Remember that a small amount goes a long way when rehydrated. You can buy this fungus at medicinal Halls or online at Qoo10. As for bean curd sheets (foo chook) I used the flat variety which is normally used for desserts. The important thing is to deep fry it first. Likewise, the bean vermicelli needs to be fried first. You can add lily buds but I didn't for this lot. Rehydrate the mushrooms overnight in tap water I (about 6 hours). After that, cut off the hard stems. Rehydrate the scallops in bowl of water for about 20 minutes. Rehydrate the black fungus. In a small heated pot, add the mushrooms, 1 tablespoon of sugar, 1 tsp of salt and the dried scallops along with the water it was dehydrating in. Braise gently for 45 minutes. Mid way through, add the black fungus. Avoid using soy sauce as it will make the mushrooms sours and in any case, I like my chap chye to have white creamy look. Slice the cabbage in rectangles pieces of about 2 inch in length. Separate the stems and leaves. Heat the oil in a wok in gentle fire. Add the fermented bean cubes and stir fry for about a minute. Add the stems, water and braise for 15 minutes. Cover the wok. Then add the leaves and braise for another 15 minutes. 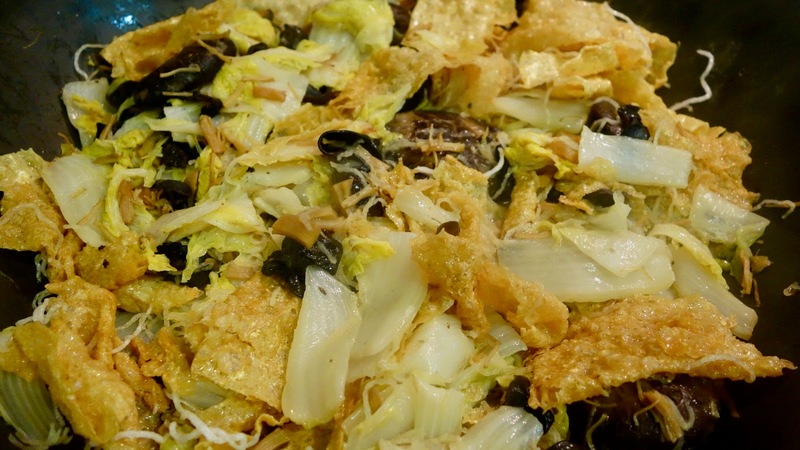 Lightly deep fry the bean curd sticks and bean vermicelli. Then pour in all the ingredients in the mushroom pot and the fried bean curd and vermicelli. Using a scissors, cut the mushrooms into halves. Braised for another 10 minutes. Taste and add some salt if you prefer. You can enjoy it on its own or with white rice. Get use to braising the cabbage to the right texture and getting the flavours right. You can always vary the ingredients. Except for the cabbage, in a sense, everything else is optional. For daily dinners, I will say, use whoever you have on hand. And remember to eat with chopsticks please. During Chinese New Year, you can add more "treasures." I have another Lo Hon Chai recipe already blogged here.